Hallo guys. Welcome to this Bizanosa course. In this course we’ll take a look at MailChimp. Have you ever wanted to send email Newsletters and you don’t know how to go about it? Or perhaps you’ve been hiring people to do it for you , well , this course is for you. 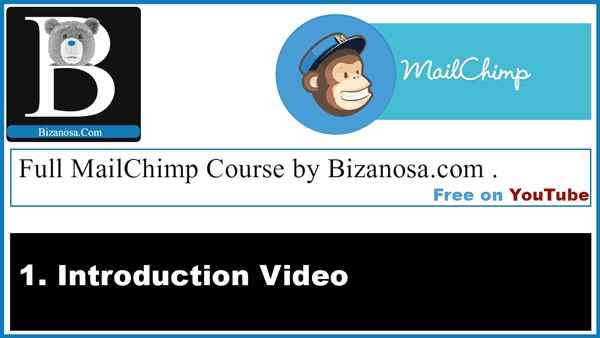 In this course we’ll take a look at MailChimp. You’ll learn how to create your list, how to embed forms, how to send your campaigns. First we’ll take a look at registration . In the registration part we’ll see how you can register on MailChimp. Then we’ll take a look at Lists. So we’ll take a look at how you can create the list , how you add the subscribers , the different methods of importing subscribers. Then we’ll take a look at forms .in MailChimp forms you’ll see the different types of forms that are available and how these forms can be used by you without necessarily having a website. We’ll also take a look at Templates .This is one of the most important things, how your send your email when you are sending your campaigns out to your subscribers. So we’ll take a look at templates and how to go about creating templates, how you can use themes that are already available on MailChimp and how you can use your own templates After looking at Templates we’ll go in to the important part of campaigns. In Campaigns we’ll take a look at how you can send your campaigns . After we’ve set up our template we’ll see how we can send out that template to our subscribers. And if there are any other features that are remaining we’ll take a look at them to wrap up. Okay guys watch all the videos in this course and you are going to have the knowledge necessary to use MailChimp. Like the videos and do not forget to subscribe to our channel because there is a lot more to be learnt .